Everyone who knows me knows that I am a big believer in the value of diversity. Not necessarily diversity of things like ideas--which should be winnowed such that only good ones survive--but diversity of culture. 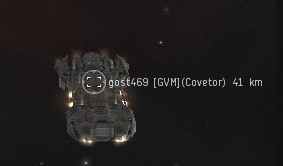 EVE provides one of the most "international" game experiences in the world. Too often, the English-speaking EVE community writes off non-English-speakers as sweatshop workers, bots and RMT'ers. Actions, of course, are a kind of universal language. When someone runs afoul of the Code and is prevented from mining, he immediately understands what is happening to him. However, the goal of the New Order is not merely to punish people who do things we don't like. Our real goal is to get people to change their behavior. That requires extra communication, because not everyone responds to punishment in the same way. 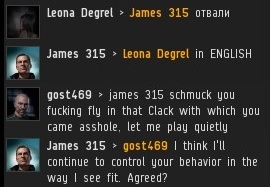 When gost469 resisted my efforts to have him speak English, I didn't give up on the poor fellow. "No miner left behind" is our motto for good reason. 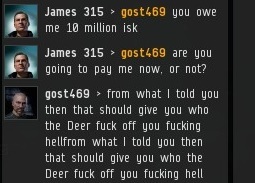 My policy for dealing with miners like gost469 is to repeatedly request that they speak English until they comply. So far, the results have been good. It's not out of laziness that I ask them to speak my own language; it's simply my determination that this is the most efficient way to go about things. I don't like having to use Google Translate too much, and that dislike translates into inefficiency. If there were a more efficient way to do things, I would do it in a heartbeat. By forcing everyone into the New Order, we increase the diversity of the New Order's membership. Everyone has to follow the same Code, but the Code-followers as a group are diverse, because they come from all over. 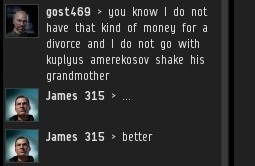 Even though I had just given him a bit of encouragement, gost469 felt it was a good time to prematurely end the convo. This meant more bumping, which reminded gost469 of our shared unviersal language. Some question the value of diversity. To me, the numbers just make sense. The more people from different cultures we force to obey the Code, the greater the total number of people following the Code. Once we reach a 100% compliance level, we will simultaneously have 100% diversity, as well. You can help us broaden the spectrum of the New Order rainbow by reaching out to people from other cultures and encouraging them to pay 10 million isk, follow the Code, and pledge loyalty to me in their bio. Tolerance: It's not just a good idea, it's the law.